Hong Kong Global Sourcing Agency Service | AsiaBC HK: Register Company. Open Bank Account. Save Tax. AsiaBC offers Hong Kong-based international sourcing service to support both Hong Kong and overseas small-and-medium sized enterprises. 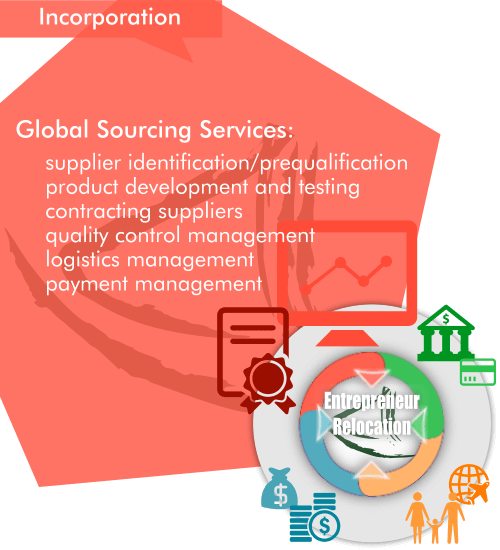 Global sourcing is a business strategy for enterprise to outsource their business operations to external suppliers in foreign countries for cost saving. To implement procurement strategies to ensure the quality of services and goods, global enterprises have established their sourcing offices in several manufacturing countries. AsiaBC is a Hong Kong based sourcing agency, we partner with a number of global purchasing firms, especially in the mainland China, which can provide tailor-made sourcing and supplier verification services for global buyers in faster, cheaper and easier approach. For worldwide buyers, our purchasing agencies is your reliable partners to cope with the most challenging business environment. Overview of Global Sourcing Agency Services as a part of our Entrepreneur Relocation by Asia Business Centre. Our expertise mean your benefit. We seek the suppliers based on your business requirement. We reach the reliable suppliers which have proven track records. We manage and monitor the end-to-end sourcing and production processes. We delivery high quality and low cost products under your specifications. 2 typical approach to fit your business models. Incorporate a limited company in a low-tax, customs duty-free, and free-trade jurisdictions (e.g. Hong Kong) for intermediary trading activities, this company is positioned itself as a re-seller: it buys goods from supplier and sells them to your downstream companies, it makes profit on the product being sourced and thus settle the tax liabilities in this region. Contract an external sourcing service provider as middleman, the provider charges service fee in either form of commission basis or fixed price (or mixed commission and fixed fee) for the overall management in the processes on your behalf.